I'd be really curious to know if you all have a good Toddler Advent Season devotional type of book. I haven't come across any just yet but I do have a couple of ones that are geared more for older kids that we currently glean from. We browse and adapt things for use from these two books. Christ in Christmas: A Family Advent Celebration is out-of-print at this time but can be picked up for an economical $0.01 on Amazon. (ha!) We had this book when I was growing up and my parents used it. When I found a copy at our local Christian bookstore, I picked it up more for the memory of it than because I thought we'd be able to instantly use it. 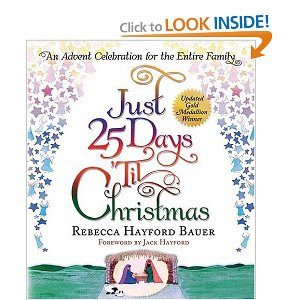 This book takes you through the advent season, week by week. The devotionals in this book are written by James Dobson, Charles Swindoll, James Montgomery Boice and R.C. Sproul. It is filled with lessons, questions for discussion, songs to sing, and scripture passages to read. I think book is perfectly suited to ages 6 and up. I think four is a bit too young, and one and half most definitely is. But we can poke through and pick up bits and pieces to share with our boys this year. It seems that Bauer is a big fan of the Christmas season which makes it easy for me to connect to her writing style. Hints to parents on how to bring their children into the festivities, instead of relegating them to the role of viewers only. I really like Just 25 Days 'Til Christmas and find it to be very practical. Do you all have any you can recommend? I've browsed our local Christian bookstore but I just haven't seen anything and so if you have a suggestion, please leave one in the comments! I'd be curious to know of any other resources along these lines so that we can make EVERY Advent season fresh and new to our children! You know that I like the little advent book set we have. http://livelearnlove226.blogspot.com/2010/11/manger-baby-and-advent-book.html. 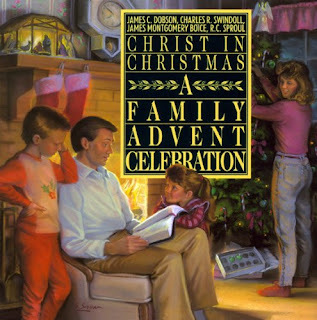 I'm not home right now, but your post made me remember another advent book we have...for the family...but I have no idea the name. I will have to dig it out and use it this year...hasn't been used since I taught.